If you have forgotten your reservation number or for any other question, click on the "Feedback" button. Located 15 km south of Geneva, this camping residence is surrounded by a large orchard. It features 2 pools and a large sun terrace with a view of the French-Swiss Mountains. 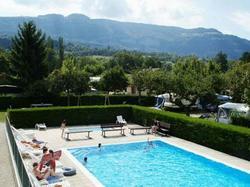 Camping La Colombiere offers caravans and chalets, each with a private terrace and barbecue facilities. They have a fully-equipped kitchen, which includes a microwave and a coffee machine. Guests can enjoy regional cuisine at La Colombiere?s restaurant, Chez Tony. It has exposed wooden beams and a rustic décor. The Colombiere Camping provides a children's playground and entertainment staff. The residence is situated next to the A41 motorway, and each chalet has a free private parking space. The residence requests a deposit of EUR 230 and a cleaning deposit of EUR 50, to be paid on arrival. Deposits will be returned at the end of the stay when an inventory has been conducted. Reception is open everyday from 8:30 to 18:00, and from June to September from 8:00 to 20:00. In case of late arrival, please contact the reception in advance in order to obtain necessary documents. This caravan has a private entrance. Click here to see your reservation.